Listed as threatened under the Endangered Species Act and designated as depleted under the Marine Mammal Protection Act. Collisions with boats, entrapment in flood gates, entanglement in fishing gear, loss of warm water habitat, toxins associated with red tides, cold stress, disturbance by swimmers and divers. Manatees are herbivores and feed primarily on sea grasses and freshwater vegetation. In winter, East and West Coasts of central and southern Florida. In summer, East Coast manatees range north into the Carolinas, with some animals occasionally found as far north as Rhode Island. 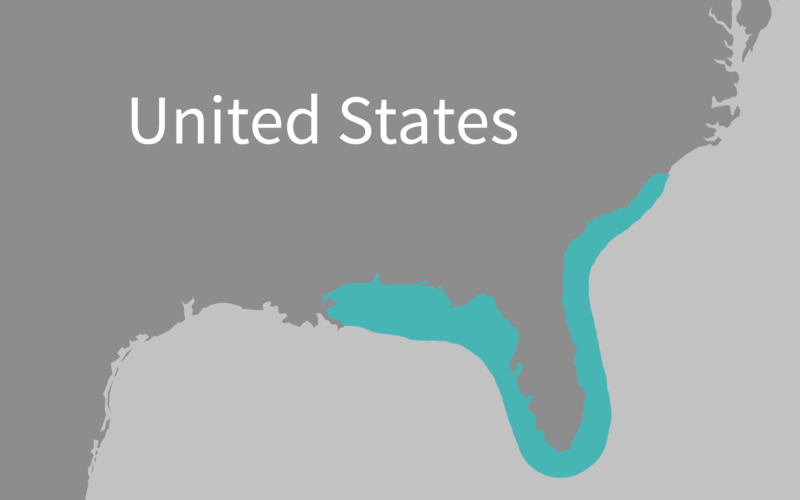 West Coast manatees range west to Louisiana, but have also been found in Texas and in a few cases, Cuba and the Bahamas. 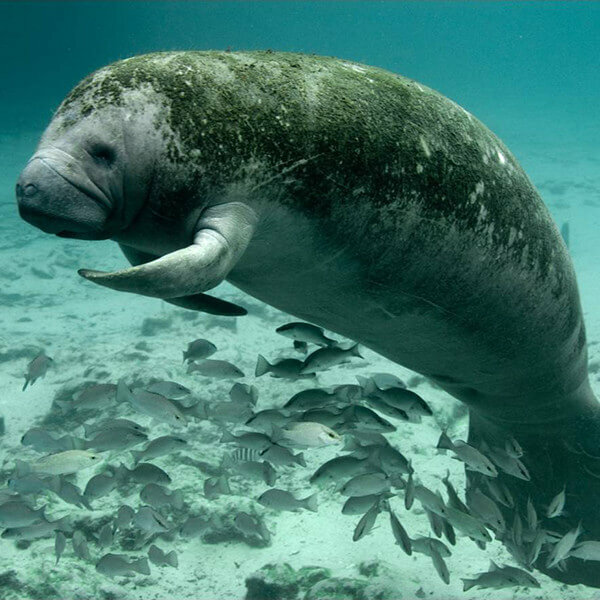 The Florida manatee occurs only in the southeastern United States where it occupies the northern limit of the species’ range. Manatees live in freshwater and estuarine systems and rarely venture into nearshore ocean waters except to travel between adjacent rivers or estuaries. Because prolonged exposure to water temperatures below 18°C (65°F) can be lethal to manatees, Florida manatees are confined largely to the southern two-thirds of the Florida Peninsula in winter. There they aggregate at warm-water springs and thermal outfalls from power plants, or remain along the edge of the Everglades at the southern tip of the state. As water temperatures rise in spring and summer, Florida manatees disperse throughout the state and into neighboring states. Florida manatees are managed jointly by both the U.S. Fish and Wildlife Service (FWS) and the Florida Fish and Wildlife Conservation Commission (FWC). 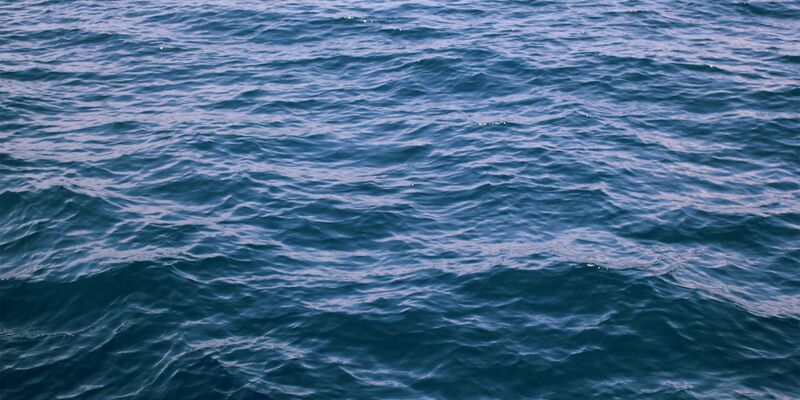 Collisions with boats are the primary cause of human-related deaths. Manatees are also threatened by loss of warm-water habitat and periodic die-offs due to red tides and unusually cold weather events. Florida manatee abundance has increased over the past 30 years and FWS recently down-listed the entire species to threatened. The total abundance for the Florida manatee population state-wide was revised in December 2018 and is now estimated at 8,810 manatees, with a 95 percent confidence interval of 7,520 to 10,280 manatees. This estimate is based on aerial surveys conducted in 2015-2016 and accounts for possible error in the detection of animals using a statistical model developed by FWC’s Fish and Wildlife Research Institute (FWRI). This estimate is higher than previous minimum counts, which were based on synoptic surveys that did not account for animals absent from survey sites or not seen by observers. Aerial surveys conducted in 2011-2012 also produced a lower abundance estimate of 6,350 manatees. The recent higher abundance estimate suggests that manatee numbers are steadily increasing in Florida, an indication that manatee conservation measures are contributing to recovery of the population. Despite the increase in manatee abundance, manatees continue to face numerous threats and experience high levels of mortality. As shown in the table below, collisions with boats are a frequent cause of human-related deaths. High mortality levels can also be attributed to cold weather and red tides, and the frequency of such events appears to be increasing. In the long-term, loss of warm-water habitat due to the eventual closure of power plants and decreasing warm water flow at natural springs may significantly threaten the recovery of Florida manatees. 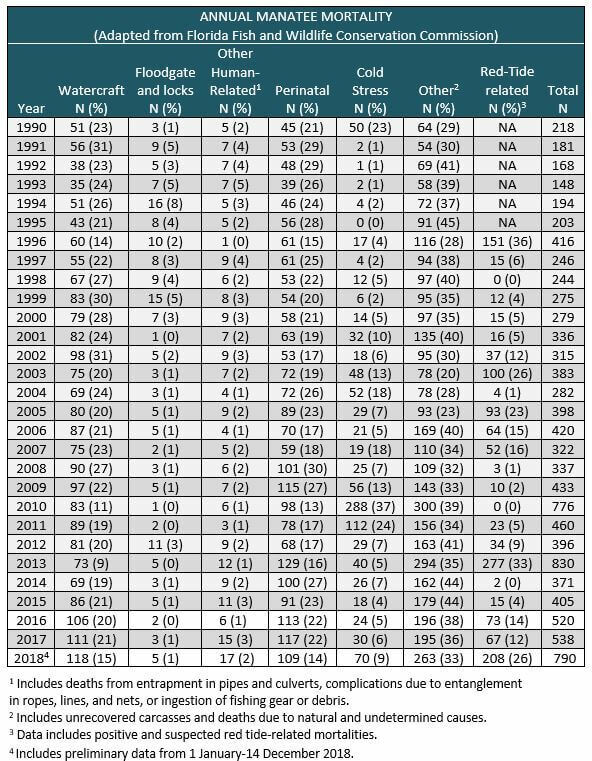 Annual Florida Manatee mortality from 1990 to 2018. Annual number and percentage (in parentheses) of known Florida manatee deaths in the southeastern United States (excluding Puerto Rico). 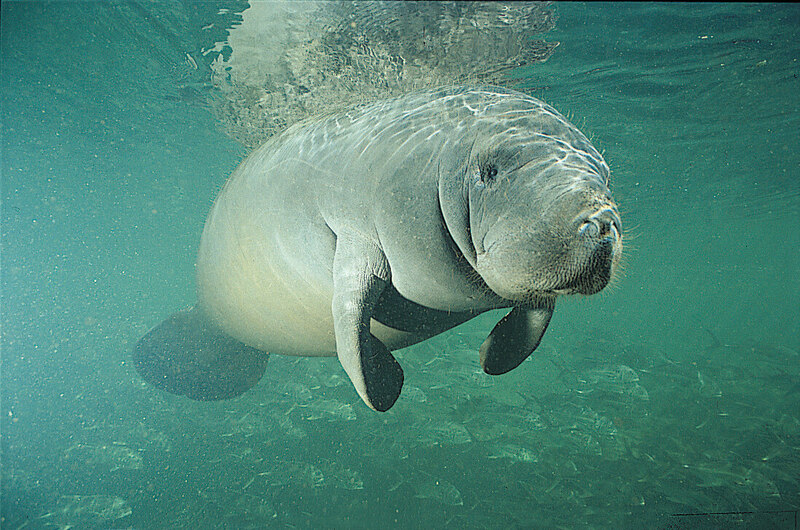 The West Indian manatee consists of two subspecies, the Florida manatee and the Antillean manatee. Until recently, both subspecies were listed as endangered under the Endangered Species Act (ESA). However, on 5 April 2017, the Fish and Wildlife Service (FWS) reclassified the species, including both subspecies, as threatened. In response to the proposed listing change, the Commission recommended that the two subspecies be considered separately. The Commission noted slow growth of the Florida manatee population over the past 30 years and recommended that a change in the Florida manatee’s listing status be deferred until the completion of additional analyses of foreseeable threats. In particular, the Commission believed that FWS should assess the potential harmful impact on manatees of a reduction in warm-water refuges through the retirement of power plants, as well as the effectiveness of boat speed restrictions. In addition, the Commission opposed changing the listing status for Antillean manatees, which, outside of Puerto Rico, continue to face considerable threats from habitat loss and degradation, hunting, fisheries bycatch, pollution, and human disturbance. The Sirenia Specialist Group of the International Union for the Conservation of Nature (IUCN) estimates that only about 2,500 mature Antillean manatees remain and projected that the subspecies would decline by 20 percent over the next two generations (40 years) in the absence of effective responses to current and projected anthropogenic threats. The Commission also noted the distinct distribution of Antillean manatees within their range and recommended separate population assessments, if they were designated as discrete population segments under the applicable FWS policy. In December 2012, the U.S. 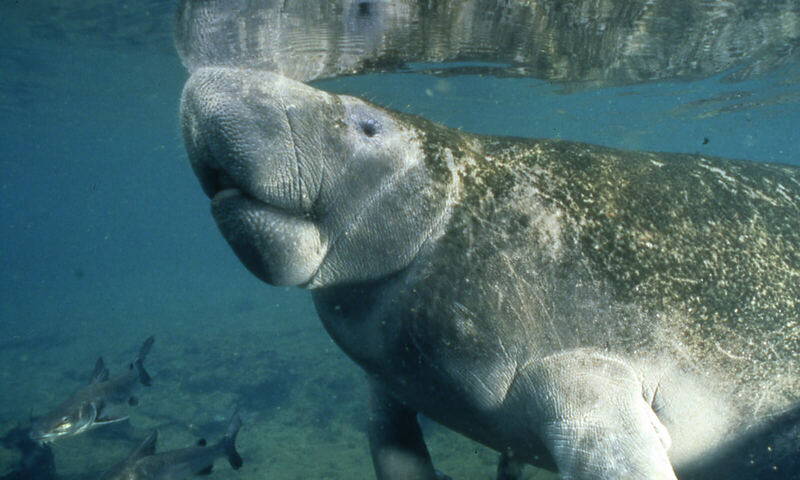 Fish and Wildlife Service (FWS) received a petition requesting that all West Indian manatees, including Florida manatees, be reclassified from endangered to threatened under the Endangered Species Act (ESA). We met with FWS officials in 2014 to discuss the agency’s response to the petition, which was also reviewed at our 2015 annual meeting. While recognizing that the population of Florida manatees has increased in size, we remain concerned about the need to assess the effects of recent record high levels of manatee mortality levels on population trends before taking any action to reclassify the species. We are also concerned with the loss of warm-water habitat due to eventual retirements of power plants over the next 30 to 40 years. Coupled with threats to natural warm-water springs, this could threaten the future manatee population in Florida and reverse past recovery progress. Most Florida manatees now depend on power plant outfalls to survive cold winter periods. A decision on the petition to reclassify manatees is still pending (see the Letters tab for links to Commission letters commenting on listing actions). We have also been concerned about the harassment of manatees by swimmers, divers, and kayakers at the Kings Bay warm-water refuge in the town of Crystal River, and particularly at Three Sisters Springs, the site’s largest spring. Parts of Kings Bay, including Three Sisters Spring, are managed as part of the FWS’s Crystal River National Wildlife Refuge. In August 2014, the Save the Manatee Club petitioned the FWS to close Three Sisters to human access during the winter manatee season. In response, we wrote to the FWS in November 2014 noting the urgent need for further steps to reduce harassment in the spring and repeated past recommendations that the FWS adopt a no-touch policy and a minimum approach distance for swimmers. In early 2015, we conducted a site visit to Crystal River and met with involved federal, state, and local officials as well as local citizens and environmental group representatives to review manatee management efforts and plans at Crystal River. These matters were further considered during the Commission’s 2015 annual meeting. During the winter of 2014-15, Refuge staff temporarily closed Three Sisters Spring to human access on several occasions when high numbers of manatees were present in the spring. The FWS is developing additional measures to be put in place for future manatee seasons. See Florida manatee sections in chapters on Species of Special Concern in past Annual Reports to Congress. Laist, David W., Taylor, Cynthia, and Reynolds, John E. III. 2013. Winter Habitat Preferences for Florida Manatees and Vulnerability to Cold. Laist, David W. and Shaw, Cameron. 2006. Preliminary Evidence that Boat Speed Restrictions Reduce Deaths of Florida Manatees. Laist, David W. and Reynolds, John E. III. 2005. Influence of Power Plants and Other Warm-Water Refuges on Florida Manatees. Laist, David W. and Reynolds, John E. III. 2005. Florida Manatees, Warm-Water Refuges, and an Uncertain Future. Lowry, Lloyd, Laist, David W., and Taylor, Elizabeth. 2007. Endangered, Threatened, and Depleted Marine Mammals in U.S. Waters. Taylor, Cynthia R. 2006. 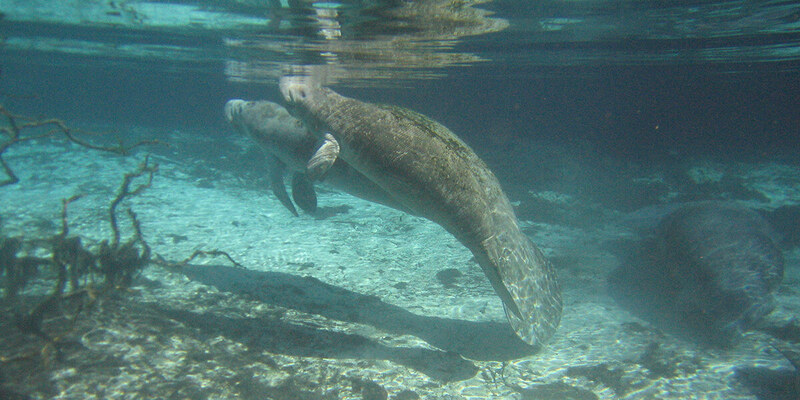 A Survey of Florida Springs to Determine Accessibility to Florida Manatees (Trichechus manatus latirostris): Developing a Sustainable Thermal Network. Weber, Michael L. and Laist, David W. 2007. The Status of Protection Programs for Endangered, Threatened, and Depleted Marine Mammals in U.S. Waters. The leading human-caused threat to Florida manatees is collisions with boats. Propellers and boat hulls can inflict serious or mortal wounds. Most manatees have scars from such collisions. The greatest long-term threat to manatees may be the loss of warm-water habitat that manatees need to survive cold winter temperatures. Instances of manatee harassment are also a problem in areas of naturally occurring warm-water springs. When humans disturb manatees, it can alter their natural behaviors important for survival. Additionally, manatees can be killed by neurotoxins associated with red tides that occur most often in southwest Florida. These toxins can be inhaled when they surface to breathe in affected areas, or ingested when they eat sea grass encrusted with tunicates that accumulate the toxins. In 2013, an unprecedented number of manatees died from a large and persistent red tide outbreak in southwest Florida. 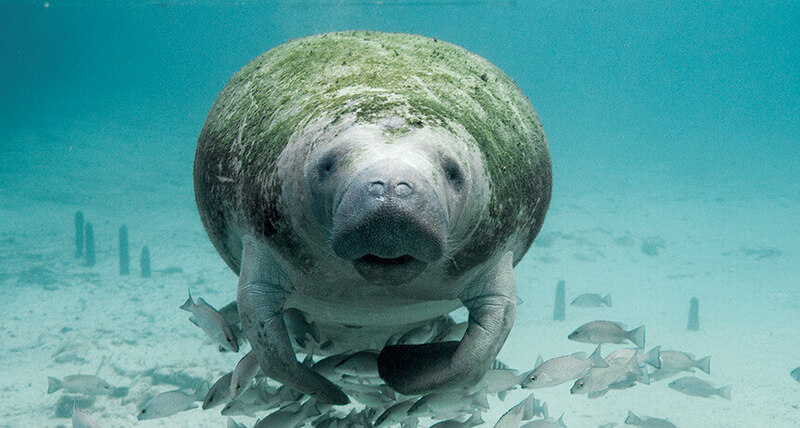 Work needed to conserve manatees is identified in a Florida Manatee Recovery Plan and is coordinated jointly by the U.S. Fish and Wildlife Service and Florida Fish and Wildlife Commission. The plan sets forth a list of tasks geared toward recovering manatees from their current endangered status. 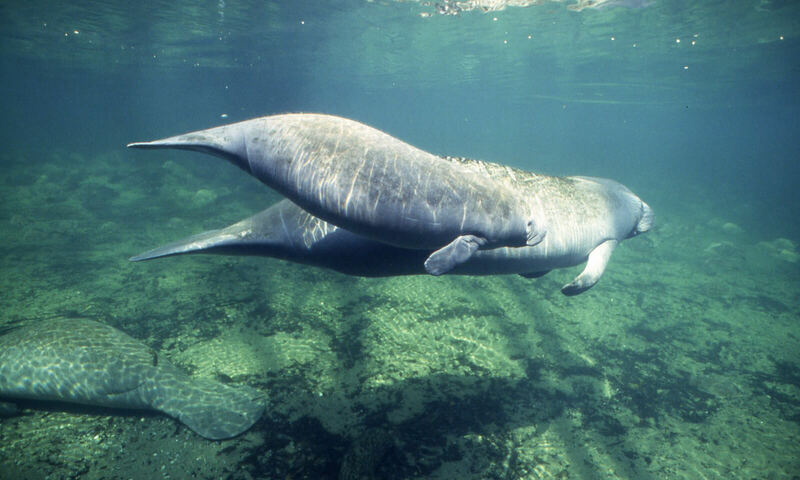 In part, these tasks include: conducting research to monitor the status of Florida manatees and their habitat use patterns, the development of site-specific boat speed zones for manatee protection, rescuing and rehabilitating distressed manatees, education and public awareness, protecting warm water refuges, and enforcing regulations to protect manatees. Ongoing activities include efforts to respond to and investigate manatee mortalities, monitoring the effect of temporary power plant shutdowns at plants being converted from oil to gas fired generators, improving conditions and protecting manatees at natural warm water refuges, continuing manatee rescue and rehabilitation work, responding to reports of manatee carcasses, monitoring the abundance of the Florida manatee population, tracking manatee movements through photo-identification and satellite-linked radio telemetry, and strengthening management efforts to prevent harassment by divers at Crystal River.